Citizen News Network writes how Gram Vaani’s Relief News lines at community radios in flood affected regions of Uttrakhand is promoting citizen journalism. Read the original source here. Today’s South Asian alternative media are thumping the issues of disaster management, mis-governance and human rights in the region. EK duniya anEK Awaaz gives prominence to, “Disaster management guidelines and protocol must incorporate Community Radio.” Gram Vaani reports about its Uttarakhand Rahat Samachar lines for the flood victims; India Unheard reports: MGNREGA: No Employment, No Money; Kafila writes: “Local Leader, National Ambitions: The Curious Case of Mr Narendra Modi”; One World South Asia reports: In Bangladesh, torture is endemic; India Togetherhighlights, “New report on Posco, but who’s listening?”; TwoCircles.net (TCN) reports, “Kashmiris are fed up with violence”. On the other hand, today’s mainstream media covered: IAF rescue chopper crashed in Uttarakhand; Maoists killed two in Bihar; Supreme Court gave reprieve for Madhya Pradesh MLA whose seat was declared vacant; In Rajya Sabha polls, congress will support DMK candidate Kanimojhi. Community Radio enhances the flood affected population’s access to vital information through the establishment of mobile community radios. Gram Vaani reports about its Uttarakhand Rahat Samachar lines. Gram Vaani is a social development organization based in India, building open-source technologies for community media in rural areas. Their flagship product is a radio automation system called GRINS (Gramin Radio Inter-Networking System), designed for rural areas of developing countries. This media has been operating Relief News lines at different community radio stations of the flood affected regions of Uttrakhand. To know or inform about the situation in affected regions and receive news about the citizens stranded in Uttrakhand, please call in the following toll free numbers of community radio stations. As per Gram Vaani, “These are not “helpline” numbers, but people can use them to report news as well as listen to the latest news reported by others”. The role of community radio is tremendous in the natural calamities. The local-dialect community radio stations have been warning residents about cyclones and helping farmers cope with erratic weather patterns. People in the countryside, most of whom are illiterate, can easily understand weather bulletins and other instructions. Community radios have been broadcasting live programmes on health issues, like the prevention of cholera and malaria, and on other important issues, like child rights in emergencies, and continued to do so during the time of the floods. They air radio spots that inform and sensitize the communities and try to reach all flood-affected families. The Mahatma Gandhi National Rural Employment Guarantee Act (MGNREGA) addresses itself chiefly to working people and their fundamental right to live with dignity. The success of the MGNREGA, however, will depend on people’s realisation of the Act as a right. Effective levels of awareness and sustained public pressure are crucial to ensure that the implementation problems are addressed and the objectives met. The Forest Rights Act or the Tribal Rights Act is a key piece of forest legislation passed in India on December 18, 2006. The law concerns the rights of forest-dwelling communities to land and other resources, denied to them over decades as a result of the continuance of colonial forest laws in India. The Act claims that it will redress the “historical injustice” committed against forest dwellers, while including provisions for making conservation more effective and more transparent. Modi’s recent action in Uttarakhand is part of vote bank politics. It is a tragedy that we have allowed demographic faultlines to be used as a political wedge issue. It is time to attempt a mission that will over time permanently bury these demographic faultlines. We lament corruption, yet we fail to recognise that when immoral politics are accorded moral sanction using identity as a wedge, such corruption is an inevitable outcome. Bangladesh is not unfamiliar with political violence; state backed terrorist activities and cruelty of its law enforcement wings. Corruption and brutality is common language of Bangladesh Police. Last month, the combined forces of the secular regime including its “civilian” gangs, led by police and military forces, attacked the defenseless protestors who were quietly praying, doing zikr and resting, many even sleeping after the daylong rallies. What followed is horrific beyond words. Blood flowed in the streets as the Muslims were indiscriminately slaughtered. Truckloads of the dead are being taken away by the regime’s forces. As the crowd was resting next to Baitul Mukarram, the central mosque in Dhaka, the secular gangs tried to set fire to the entire mosque complex. Scores of book stores selling Islamic books, Qurans and Hadith were burned to ashes. Other news covered by this media are: Despite I&B ministry nod, Dehradun CRS yet to go on air; World marks International Day against Drug Abuse; Civil Society to rope in Panchayats for Uttarakhand relief; Every country affected by sexual violence: Angeline Jolie. One of the primary difficulties of implementing effective counter-terrorist measures is the waning of civil liberties and individual privacy that such measures often entail, both for citizens of, and for those detained by states attempting to combat terror. At times, measures designed to tighten security have been seen as abuses of power or even violations of human rights. There are evidences of widespread torture by Indian police and security forces and the systematic abuse of detainees. The people’s movement against POSCO started soon after the signing of the MOU between POSCO and Odisha Government. Since then over hundred bombs have been thrown at the resisting villagers by the pro-POSCO goons and around 100 villagers have been shot by the Odisha police. More than 1500 villagers and activists are facing over 250 fabricated false charges. Many villagers cannot come out of their villages even for their hospitalization, due to the threat of arrests. India and Pakistan have fought three major wars (1948, 1965 and 1971) of which the first two were fought over Kashmir (1948, 1965). There were several low intensity military skirmishes between India and Pakistan over Kashmir in the past six decades, most intense being the standoff over Siachen glacier in 1983 and 1999 Kargil Conflict. Thus far many lives have been lost due to this conflict and the Kargil conflict highlighted how perilously close the region could be to a nuclear war, which would be devastating not only for both countries but also for the whole region. Any normalization of relations between the two countries as well as the mounting human and financial costs of the conflict necessitates a speedy resolution of the Kashmir issue. Other news covered by this media are: ‘Madrasa graduates should be ready to face future challenges’; Several women activists participate in Rihai Manch dharna; IBPC Sharjah to raise Rs.10 million for Uttarakhand disaster. The Janathā Vimukthi Peramuṇa (“People’s Liberation Front”) is a Marxist-Leninist, communist political party in Sri Lanka. The party was involved in two armed uprisings against the ruling governments in 1971 (SLFP) and 1987-89 (UNP). After 1989, JVP entered into the democratic politics by participating the 1994 parliamentary general election. During natural disasters, and for some time afterwards, the people affected by them usually have millions of questions and are desperate for information. In many cases, they do not understand what has happened, what to do next and whether there is still any danger. These are questions in need of answers. Having a community radio that meets their information needs helps the affected families and their communities stay up to date on what is happening. Radio also plays a key role in bringing community members together to discuss the issues that affect them. Marginal or alternative media spaces, cracks, or fissures in the mediascape are associated with increased and more democratic access, freedom of expression and operation, as well as creativity and innovation. 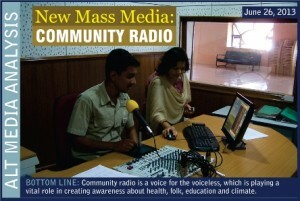 Community media is championed by many, including international development agencies, as a tier of broadcasting that gives voice to the voiceless and provides an important channel for local development and the enactment of citizenship. State support in terms of adequate legislation and funding, especially in the early stages of the development of community radio in India is clearly the key to the development of effective citizens’ media.